Hot Dog Machines For Sale in South Africa and importing into Africa at the best prices. Hot dog machines are great for starting up your own business because its a worldwide dish. Hot dog machines are built for merchandising – they put the product front and center so your customers can see, smell, and want to buy your delicious hot dogs. So use hot dog machines accessories like organisers, divider kits, add-on tong kits, and bun drawers to make your work much easier. Hot dog machines are appealing to customers and very easy to use. We also have plenty of hot dog equipment parts, like heating elements, knobs, and controllers that are perfect for getting a broken hot dog grill or steamer working again. These hot dog equipment replacement parts are available for a variety of makes and models. Hot dog machines are both versitile and durable all at the same time. We have many hot dog machines for sale. Hot dog machines are easy to use and easy to maintain so theres no hard labour involved. 7x Rolling Hot Dog Machine has a stainless steel body cover. Quality motor, high efficiency heating element. It has organic glass, it’s no harm to food. It can heat up and keep warm with stepless control. It’s applicable to a variety of occasions, such as restaurants, food stores, fast food restaurants, parties and so on. Hot dog machines are built from materials that resist corrosion, are hygiene friendly, and are easy to clean. Hot dog machines are great for small businesses that want to grow in the catering industry. Hot dog machines is the most popular hot dog cooker because it is economical, reliable, easy to use and clean. 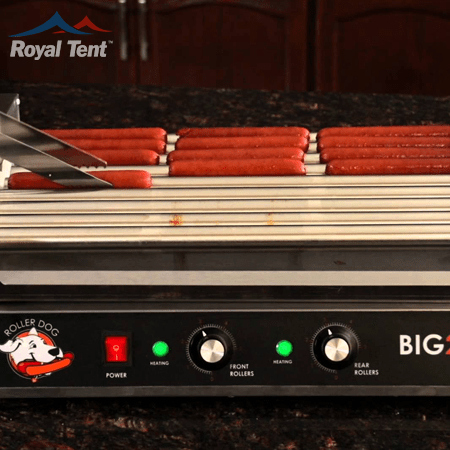 Save valuable countertop space by using an all in one hot dog machine. Once you buy this machine you will never go back to any other hot dog machine.